With the Hunger Games premiere date just around the corner, Lionsgate is already searching for the next big teen blockbuster. 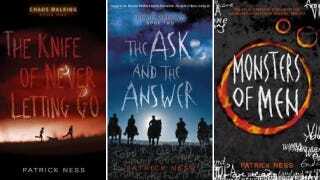 And they've chosen Patrick Ness' Chaos Walking trilogy. But will this dystopian society rival the blood splattered world of Katniss and friends? THR is reporting that Lionsgate has snapped up the rights to Chaos Walking and is working with Doug Davidson, of How To Train Your Dragon fame, to produce the film. The trilogy is set in a dystopian future against a backdrop where humans are colonizing a distant Earth-like planet. When a phenomenon called the Noise allows everyone's thoughts to be heard, wiping away all privacy, the corrupt mayor of the colony makes a play to seize power and wipe out the indigenous alien race, with only a young man being the only one to stop him. No word yet on hopeful directors or potential cast, but we'll keep our eye out for any future developments. Fingers crossed, everyone.